We have a rare Tuesday game this week and it’s the perfect opportunity to jump on the Moneyball train! Check out or top tips inside, from the guy on the front lines. Tbetta here, and welcome to the self-proclaimed top resource for keen Aussie rules Moneyball punters! 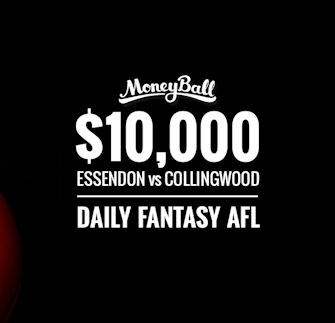 DFS (Daily Fantasy Sports) is taking off around the world and Moneyball have the perfect platform for you to turn your AFL Fantasy prowess into cold hard cash. Signing up is easy – head to moneyball.com.au and you could be ballin’ within minutes. If you’re unsure how DFS works, be sure to head to the ‘Help’ section for all the info you need to start cashing in on your AFL Fantasy knowledge. Click here to subscribe on iTunes. Even with Leuenberger back, Essendon been bleeding points to ruckmen and that’s where we’ll chase Moneyball value this week. McEvoy (84), Stefan (121), Kreuzer(127) and Jacobs (108) have all run riot aerially against the Dons; as if Brodie Grundy ($10,300 RU) isn’t a better ruckman than all of those guys? Of course, Grundy in blistering form of his own without the boost from his challengers, with his three-round average of 125 ranking as the 5th best in the league. Lock it in, Eddie. Check out the $10,000 guaranteed Bombers vs Magpies Special here. Scott Pendlebury ($10,100 MID) has earned a reputation as a “big-game player” over his career and a quick glance through his late April history proves that ANZAC Day is no exception. Check out his last 9 ANZAC Day scores:150,116, 97 (medallist), 166 (medallist), 113, 108, 107, 118 and 127. Yes, that’s an average of 122 in his past 9 ANZAC day clashes. Pendles has three scores of 110+ already this year and has to be a priority alongside teammate Steele Sidebottom ($9,500 MID). The classy midfielder has scores of 143, 124 and 144 in his past three ANZAC Day clashes and has the short-term history edge over Pendles! If we’re digging deep for value, Travis Colyer ($6,600 FWD) has to be on your wishlist. After years of promise, he enjoyed what could be come to be known as his breakout game last week, finishing with 124 from 24 touches and 3 goals. He’ll be highly owned, no doubt. Tom Phillips ($6,600 MID) was a late withdrawal due to sickness last weekend but was in great form before that with 103 vs Swans. Likewise, Andrew McGrath ($5,400 MID), has risen up the DFS rankings with his recent production. Unfortunately a MID (as opposed to being defender-eligible in AFL Fantasy), McGrath but has shown the ability to score well for his price, notching two scores of 90+ already this year. Always remember to gamble responsibly. If you’re having problems with your betting, you can get help at Lifeline or talk to someone at Gambling Help Online. Play Moneyball for a chance to win this weekend. Tbetta drops his DFS advice for the last of the Prelims.